Muller dubs his target “metric fixation.” In his introductory material, in his case studies, and in his conclusion, he highlights the many pitfalls of this fixation: once we restrict our focus to certain aspects of a situation that we can measure, we lose sight of important things that we can’t measure; we tempt people judged by some metric to set aside doing their best job and instead focus on winning at the metric game; and we encourage cheating to meet metric standards often seen as arbitrary and imposed from on high. Now I am “five times as productive” as if I had just written “x = 5”! But if metrics, while useful, fall so short of their promise, why did they become so popular and ubiquitous? Muller explains this by noting that the rise of “neophyte elites” made the new holders of elite status anxious to justify their positions: unlikely to “feel secure in their judgments,” they are “more likely to seek seemingly objective criteria by which to make decisions.” Meanwhile, “when institutional establishments came under populist attack, they too resorted to metrics as a means of defense to demonstrate their effectiveness.” Muller further contends that the “apotheosis of choice” added to the trend, as advocacy groups challenged the hegemony of experts: “The road to empowerment was paved with metrics.” And the spread of computers made tools like spreadsheets seem like an easy way to sum up an entire business without really understanding it. Before that, “expertise” meant the career long accumulation of knowledge of a specific field, as one progressed from rung to rung within the same institution or business.… Auto executives were “car guys”—men who had spent much of their professional life in the automotive industry. They were increasingly replaced by [Robert] McNamara-like “bean counters,” adept at calculating costs and profit margins. [This trend] morphed into the gospel of managerialism. The role of judgment grounded in experience and a deep knowledge of context was downplayed. 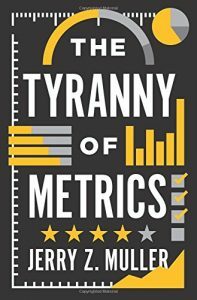 Another reason for the popularity of metric fixation in business is the rise of principal-agent theory, which claimed that management could not be trusted to act in the owners’ behalf, unless their performance was tightly monitored with … metrics. Just as Soviet bloc planners set output targets for each factory to produce, so do bureaucrats set measurable performance targets for schools, hospitals, police forces, and corporations. And just as Soviet managers responded by producing shoddy goods that met the numerical targets set by their overlords, so do schools, police forces, and business find ways of of fulfilling quotas with shoddy goods of their own by graduating pupils with minimal skills, or downgrading grand theft to misdemeanor-level petty larceny, or opening dummy accounts for bank clients. Critics of Oakeshott, Hayek, and similar thinkers often mistake their critique of rationalism as a disguised defense of the status quo in politics. But Oakeshott himself extended the critique well beyond politics (e.g., in his essay “Rational Conduct”), and others have gone further than him: Michael Polanyi and Paul Feyerabend applied it to science itself, Ludwig Wittgenstein to philosophy, Jane Jacobs to urban planning, James C. Scott to forestry and agriculture, Nassim Taleb to finance and to religion, myself to software engineering, and here, Muller extends it to management and metric fixation in general. “Rationalism” is not mainly a political phenomenon, nor is it exclusively right-wing or left-wing: rather, it is an obsession with replacing experience and judgment with formal techniques, based on a mistaken understanding of what is (falsely) supposed to itself be a single technique called “the scientific method.” (The work of Feyerabend and Polanyi ought to have destroyed the notion of a single way of proceeding called “scientific,” but for the ideological convenience of that construct.) And attacking rationalism is not a defense of whatever circumstances happen to be in place at present: rather, these attacks hold that genuine correction of current ills must be based on experience, not abstract theories. But back to our book: After discussing the history and theory of metric fixation, Muller turns to its contemporary practice: in his “case studies,” he addresses higher education, schools, medicine, policing, the military, business and finance, and philanthropy and foreign aid. In each domain he cites numerous examples of the deleterious effects of metric fixation, of which we will visit some highlights. Perhaps the most pernicious metrics used in higher education are those based on the idea that “everyone should go to college.” The original idea of the university was of a place that could educate a small intellectual elite in the disciplines of theology, philosophy, medicine, and law. Gradually that idea broadened to include mathematics and the natural sciences, but university education was still seen as a specialized sort of activity, and certainly not something that was needed to train a bank clerk or a shop manager. But a combination of democratic sentiments and an obsession with formal education, at the expense of apprenticeship, led to the idea that the more formal education, and the better “educated” our workforce, the better off we are. As a result, young people who might make excellent auto mechanics or plumbers or hairdressers are instead shoved off to college by their “guidance” counselors, whose performance is judged by measuring the percentage of graduating seniors who have been shoved off to college. Many of these students have little interest in analyzing Hamlet or proving the Fundamental Theorem of Arithmetic, but they are marched through four years of college with passing grades, only to discover that their degrees have qualified them for corporate jobs earning them only a quarter or a third of what a skilled carpenter makes. Metric fixation fares no better in the field of medicine. For instance, Muller describes how, if hospitals or individual surgeons are compensated based on the survival rate of their patients, that gives them a motive to refuse service to the most desperate cases. Police forces can respond to metric fixation in several counterproductive ways. If, for instance, officers are to be judged by a metric like “percentage of felony complaints leading to an arrest,” then a simple way to improve one’s “stats” is to report felonies that promise to be hard to solve as misdemeanors instead. Season two, episode two of the famed television series The Wire might have been written to illustrate the potentially destructive effect of metrics on policing: thirteen human trafficking victims are found dead in a cargo container. What ensues is a game of hot potato between the Baltimore city police, various state and county police forces, port authority police, and U.S. Customs officers, with each desiring to shove the case off on any other organization but their own. The reason? Having thirteen unsolved murders on their books will make their stats look bad. Actually achieving justice for the dead women is a distinctly secondary concern. Business and finance have also fallen prey to metric fixation. A major cause of the crash of 2007–2008 was the focus on numbers, which could be manipulated in financial models (which showed there was little risk in the pyramid of derivatives being erected), while the wisdom of experienced traders was dismissed as hopelessly behind the times. And bonuses at investment banks were tied to measurable achievements, meaning that “metrics provided the means, and pay-for-performance supplied the motivation, for undue risk taking under conditions of opacity.” And Muller’s final case study demonstrates that obsessing over metrics has yielded similarly poor results in the fields of philanthropy and foreign aid as in all of the other areas he previously examined. Goal displacement: where focusing on a measured goal (think standardized tests) displaces a more important one (well-educated children) because it is measured and rewarded. Diminishing utility: Initial success with metrics may encourage ever greater efforts to collect ever-less-useful metrics. Rule cascades: Once it is detected that people are gaming a metric regime, an organization may attempt to block such cheating with ever more elaborate systems of rules. This adds even more overhead to the measuring process. Muller’s final chapter demonstrates that he does not object to the use of metrics in principle, but only to the worship of metrics as a panacea that can replace experience and judgment. He declares, “There is nothing intrinsically pernicious about counting and measuring human performance.” He describes heuristics for differentiating a judicious, helpful use of metrics from “metric fixation.” It includes such advice as focusing on measuring things that are not affected by the process of measuring them, distinguishing what is worth measuring from what can be easily measured, and noting that the fact that some metrics are helpful does not mean that even more metrics are even more helpful. Most importantly, he points out that metrics developed and employed by practitioners themselves are less liable to abuse than are those imposed from the top down. While some of the case studies offered here are a little skimpy—the one of philanthropy only runs four pages, and that on the military only five—nevertheless, Muller presents a very convincing argument that metric fixation does significant harm, and ought to be resisted. And because he connects metric fixation to the wider case against rationalism, his work is an important contribution to the growing literature condemning rationalism as the great plague of our times. Gene Callahan is associate industry professor of computer science at NYU. He is the author of Economics for Real People and Oakeshott on Rome and America.